Good shots on game have nothing to do with luck. If you’re not sure, pass it up. I live in a glass house, so I am not casting stones. I have missed game, and I have lost game. The first irritates me; the second gives me nightmares. Vowing that I will never let these things happen again doesn’t help because, unfortunately, it’s not a perfect world, I’m not a perfect marksman, and not all shots are perfect no matter how hard one tries. But we can all try harder. Not a lot of folks in my business willingly expose their screwups, so I know I’m going to get letters from readers who claim they have never missed. I used to think this was a matter of lack of experience. Stick around and it’s gonna happen. Or, to be kind, maybe these people have selective memories. Both scenarios remain valid, but I now believe there’s a situational third explanation. Millions of American hunters are whitetail hunters, and many hunt from the same stands every year. Surveys show that 80 percent of American hunters never leave their home states, so it follows that a large percentage do their hunting close to home. These folks know their distances, their conditions and their game. They never have to shoot across unfamiliar ground or from bizarre field positions—and they’ve never needed to get steady while their lungs are bursting from lack of oxygen. This article is probably not for those folks. This article is also not for the growing segment who measures hunting satisfaction in yards. As I’ve said many times, it is not my place to tell anyone how far is too far. This is always based on conditions, although the equipment we have today helps. There are a fair number of shooters out there who know how to use that equipment better than I care to learn. While home-turf hunters tend to get better shots because they know what to expect, there can still be pressure to take a shot you’re not sure of due to time and other considerations. My limits may differ from yours, but limits are always condition-based. For me, the concept of ethical sport hunting remains to get as close as possible and be sure. The first depends on the situation. Long shots can be practical as a court of last resort. Being sure is inviolable, though, and even when you’re certain, you may mess up now and again. This is part of the game. And I still say: If you’ve never missed, stick around. It will happen. Actively seeking long shots on living game animals drives me insane. The folks going down this path came up in a different school and are willing to accept a greater miss rate. Also, unlike military sniping, non-vital hits don’t count. Well, actually they do. They count against you. Wounded and lost animals are unacceptable. Unfortunately, this is gonna happen, too. (Again, stick around.) However, at longer distances there’s more working against you: unreadable wind, less bullet energy, erratic bullet performance, flight time, difficulty in calling shots and so much more. Again, I can’t say how far is too far. Neither can you because every shot is different, and all are conditional. But if your interest in shooting at game starts at a third of a mile, this article isn’t for you, either. We all have our limits. Sometimes these are based on equipment. When I’m shooting a .45-70 with buckhorn sights, my theoretical range shrinks compared to when I’m shooting a fast .30 with a big scope. With any shot there must be a conscious “shoot or don’t shoot” decision. At close range this must be a snap decision. At medium range there should be at least a little time to consider, and at long range (whatever that means to you) there must be time to study the shot—otherwise the decision is already made for you. Whatever, it is always a conscious decision. You must choose and do so wisely. While it shouldn’t be a factor, we’re only human. 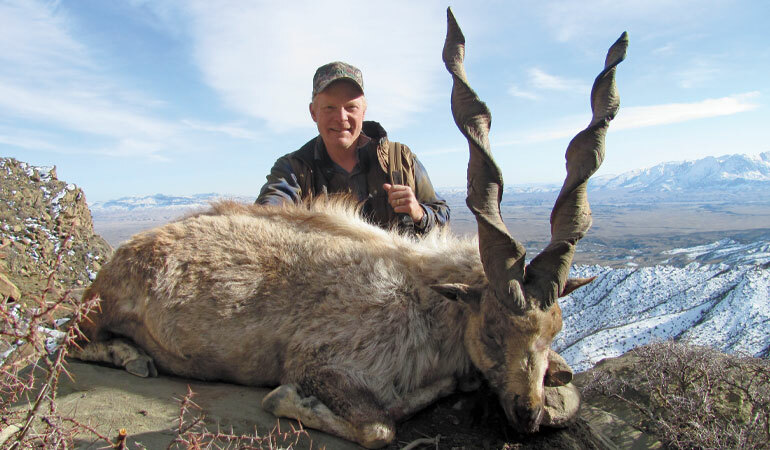 An expensive or once-in-a-lifetime opportunity like this markhor can play into your decisions on a shot, but it’s important to keep your head straight. Multiple factors come into play. It may be easier if you’re looking for venison for the freezer. 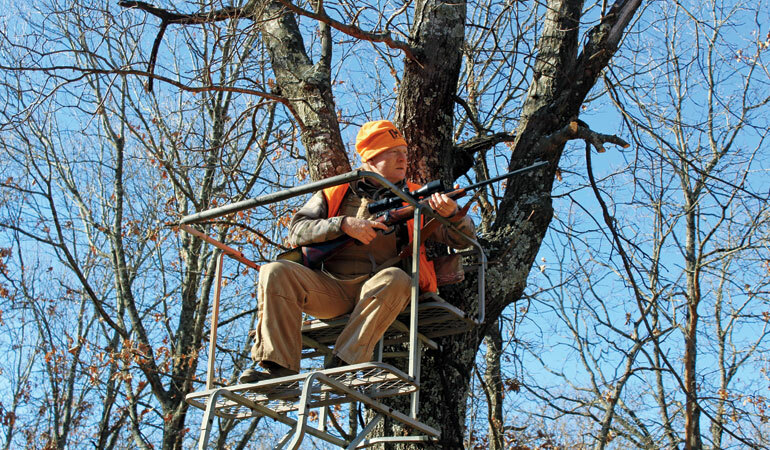 While we all get desperate, the folks who know that sooner or later they’ll get a broadside 80-yard shot from a favorite stand usually aren’t desperate. However, the amount of time you’ve put in that season and how much time is left in the season can also influence your decision-making—as can how frequently you can expect to get shot opportunities. Desperation is a poor reason to take a shot. We’ve all seen it, and although I’ve missed, I’m not sure I’ve done it because of a desperate Hail Mary shot. There is no excuse for that. First day, last day, doesn’t matter. The shoot/don’t shoot decision must be made logically based on a reasonable certainty the shot can be placed properly. For many of us, size matters. The antis have done a good job of making “trophy” a dirty word and “trophy hunter” akin to “drug dealer.” I’m a selective hunter. An animal doesn’t have to be huge, but I prefer old. This adds more psychological pressure than waiting for the first legal critter that walks by. I’m not suggesting either course is more correct, but they’re different. Finances can also add pressure for those who travel to hunt. Imagine, at the end of a tough hunt on strange turf, at last light on the last day, exhausted and desperate, you have a fleeting and marginal shot at a game animal you have paid into the five figures to pursue. What are you going to do? I know what I’m going to do: not shoot. There are no guarantees in hunting. The last day is as good as the first; the first day is as good as the last. Every potential shot is a unique opportunity that cannot be evaluated in terms of size of animal, likelihood of another opportunity, or the cost of failure. Desire for that animal is first, followed by: Are you sure you can place your bullet in the vital zone? It’s always situational. The opportunity to take a close, fast shot is mercifully brief. You can kick yourself later, but you have milliseconds to take the chance or pass on it. Just this fall I made my first, long-considered hunt on Quebec’s Anticosti Island. It’s a legendary place for whitetails, but I caught a bad year. Two hard winters had reduced the deer herd by more than half. I knew that, but I was just minutes into the hunt, bumbling down a forest trail, when a good buck jumped up and bounded away from me. I wasn’t exactly ready, but I also wasn’t asleep. I had a round chambered in the .275 Rigby, the scope was turned down, and the rifle was in my hands. I had the crosshairs on him for what Elmer Keith called a “raking shot.” Many factors went through my brainpan computer: bad angle, unclear view of the antlers, much too early in the hunt. I passed. 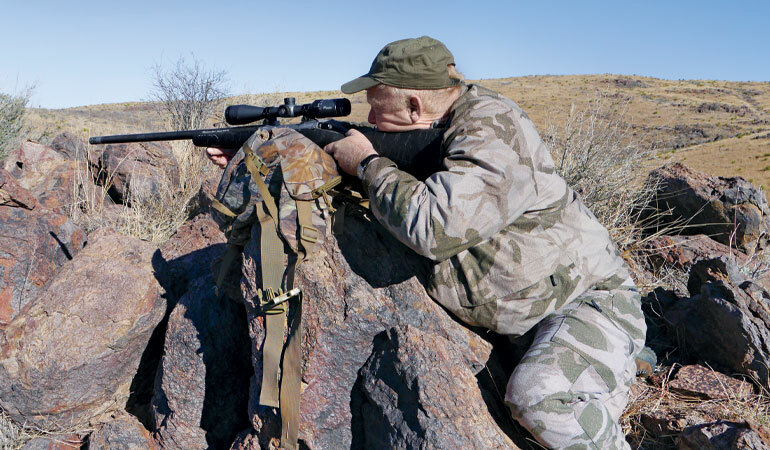 Being sure of a shot means having a solid, stable position; being able to read the wind; and having enough light remaining to gauge the animal’s reaction and follow up if necessary. You simply have to be sure. I was hunting in a two-deer area, and four days later I shot a smallish buck for “story-writing insurance.” That’s a poor excuse to take an animal, but a full seven days passed and I never saw another decent buck. You bet I kicked myself for not trying on the first buck, but the ethical hunter part of me knows it was a good decision. I’m sure I could have hit the deer, but the results were unpredictable. Yes, passing up shots can be difficult. The pass on Anticosti was easy. I had seven days to hunt, and I was fresh and excited. It’s more difficult when you’ve already worked hard and you’re near your limit, but the question remains: Are you sure you can make the shot? 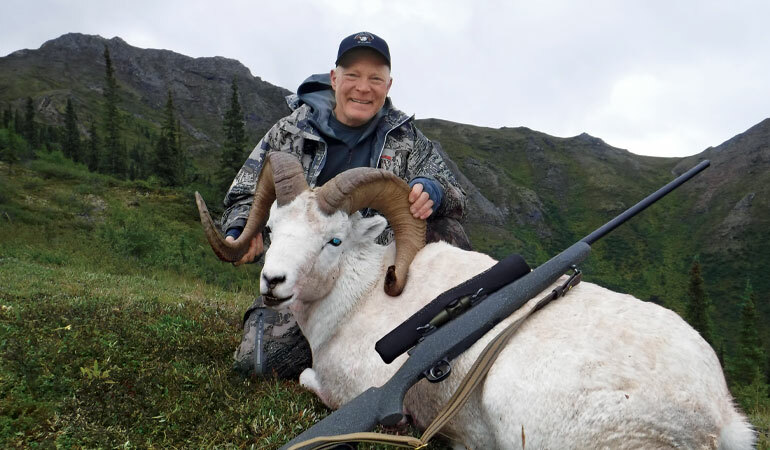 I made a backpack sheep hunt into Alaska’s Brooks Range in August of ’17. It might not be the most sensible hunt at my age, but we tried in 2015 and got weathered out. By 2017 my knees were giving me trouble, but I strapped on knee braces and up we went. It was just the third afternoon when we saw a group of three rams work through a saddle a mile above our spike camp. After they fed out of sight, we started up. We caught them feeding peacefully on the far side of the third bowl, but at 625 yards we ran out of cover and the light was fading. I was carrying an accurate .300 Win. Mag. with a Leupold VX6 3-18X on top, and the CDS turret was calibrated to the load. I’ve made longer shots, but that was approaching my limit, even under ideal conditions. I had the equipment, I knew the range and hold. I wanted desperately to take the shot—but for all the wrong reasons. My knees were sore, and I didn’t know if I could make the same climb again. The biggest ram was good. Further, both this hunt and the weathered-out hunt two years before had cost me a lot of money—and I had nothing to show for it in terms of a story. I wanted to take that shot. The turret was dialed, and the biggest ram loomed huge at 18X, but we were in a bowl and I couldn’t figure out the wind. I hated myself for it, but I passed the shot. We stumbled back to camp well past midnight in Arctic dark. This time the story had a happy ending. After additional painful climbs, we found the same band a few days later, and I shot the best of them at 122 yards. It’s the sheep shown in the lead photograph for this article. But not all passes have such a storybook finish. Even when you feel certain, bad things can happen. In 10 years of rifle seasons, I’ve lost one buck at my Kansas place. The buck was crossing a clearing at 150 yards. He stopped, and I shot him with my 7x57. Except for a blood trail that quickly ended and a long day of fruitless searching, that’s the end of that story. It still haunts me because I can’t explain it. After a million replays, I know I shouldn’t have passed the shot, but I don’t know where I screwed up. It is not the only bad shot that haunts me, but it’s worse because I haven’t a clue. Usually you know: You pulled the shot, misread the wind or angle, or just held wrong. The thing is to be sure. And to have a vast repertoire based on practice so you know how to get steady quickly. And then have the courage to know when to “just say no.” This is hard when you’re alone, and harder with a buddy or guide, but it’s an important moral decision. “Just say no” if you aren’t steady, ready and absolutely sure. The range doesn’t truly matter because distance is just a number. An unsteady position or gale-force winds may make a 250-yard shot impractical, while a shot at twice that distance under ideal conditions may be acceptable. Fading light is another factor. Seeing the animal properly is just one consideration. Can you see the reaction to the shot, and can you find him in the dark? For an ethical hunter, it’s critical to care that you do things the right way. In the end, taking a shot is your call to make. And you’re the one who has to live with the consequences.